It's finally back to school season! If you're anything like me, you're probably both excited and stressed out at the same time. I find that there's no better way to make the excited part of me dominate than to get organized and buy new things for the upcoming school year. 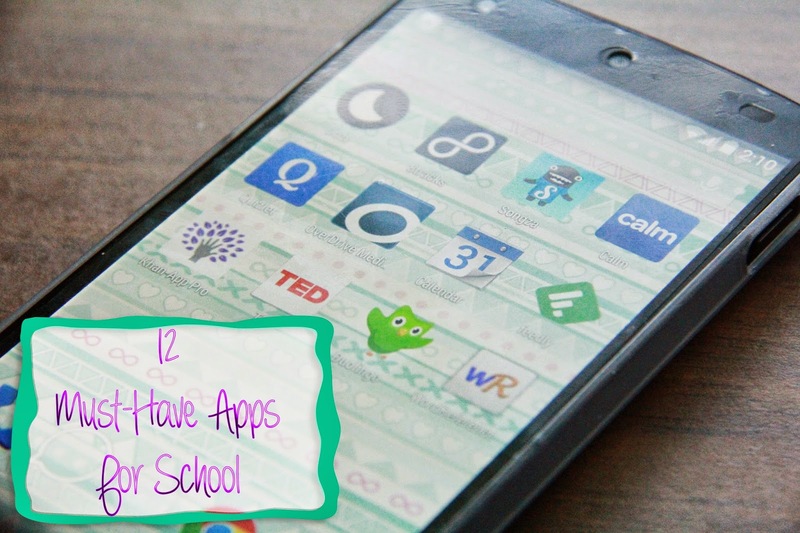 And let's face it, these days, an essential part of our school and classroom experience comes from our phones... so without further ado, here are 12 apps I have found essential to my daily school life. Doze is an app I actually used quite a lot last year. Listening to music is a must for me when I study, but when it comes time to do some straight-up memorization, I find that certain songs can be distraction. That's when I usually use this app that both tunes out the noise around you and calms your mind. Unfortunately, I wasn't able to find Doze on the iTunes App Store, so I found a substitute weather app for only $1. As I mentioned before, different songs create different reactions and moods. However, every body will also react differently to the same song. I love that 8tracks is made up of user-created playlists. This way, all you really have to do is search the name of an artist or a genre and you'll find entire playlists that are made by someone with the same music taste as you. Another plus is that you hopefully won't have to constantly be skipping songs! As you can probably already tell, music is really important and influences my mood, productivity and positivity. So here's another music app. Much like 8tracks, Songza consists of playlists as well. However, these playlist are not just randomly created and posted, instead, they are carefully made by the people at Songza. They allow you to choose different playlists based on genre, artist or even based on whatever activity you're doing at the moment. Calm.com not only saved my grades, but also my sanity near the end of the last school year. The stress tends to pile up, and when I discovered this website, I found that I was able to control my stress a lot better. At the end of every school day, right before starting on my homework, the first thing I would do is pop in my earphones and run through their 5-minute exercise option. Of course, there are longer ones to choose, there's even a 2-minute session if you're really in a rush. I was so excited to find that they had finally come out with an app when preparing for this post, meaning that I can do this on the go, fully clearing my mind on the bus ride home so I can scrape up a little extra time and start my work as soon as I get home. My classmates and I have tried so many different sites and apps for virtual flashcards. After going through multiple different sites, I have found Quizlet to be the easiest to use. The design and animations used in Quizlet are extremely attractive yet minimal, and though it doesn't seem like an important factor, I'm sure I would be much less patient with study on a sketchy, poorly designed app. You can also share your flashcards with your classmates so you'll be able to split the work and maximize your study time. I mentioned this app already in my book post, however I thought I'd bring it up again here. I used to go to the library all the time in elementary school, but with the intensified school schedule, I barely go to the library at all anymore. This app allows you to checkout eBooks from your library's website and download them onto your phone so you can read them anywhere, even when there's no Wi-Fi connection. Another selling factor is that you won't have to add another weighty book to your already overflowing backpack. So this is pretty much a default app in every store. Just use it wisely, as I know many people tend to through their school agendas aside and never use them. Hopefully this app and its notifications will remind you of deadlines... and if you slacking off, that flashing LED notification light might do the trick in giving you a little push. If you're really passionate about a certain subject in school, or even an activity that has nothing to do with school and you would like to do a little reading on it, I would recommend the Feedly app. It's essentially just an RSS feed that let's you subscribe to your favourite online blogs and magazines so you can keep tracks of all the sites in one app. All you have to do is categorize your subscriptions into folders and scroll through the articles to choose which ones you want to read, or save for later. This app is a lifesaver. Let's be honest, you're pretty much never going to get an all-around amazing list of teachers for the school year. I'm pretty sure everyone has that one teacher who no one in the class can understand. Khan Academy is mainly focused on math, but the creator also constantly records new videos explaining concepts in pretty much every subject you could learn at school. He goes at a super slow pace so everyone can follow along, and if you're a faster learner, you can speed up the video with the option in the settings button on the bottom right corner of every YouTube video. I'm sure you've all heard of TED Talks. If not, it's simply made up of hundreds of videos where intellectuals from all around the world give lectures on very interesting subjects. All of these videos are hilarious, entertaining, eye-opening and extremely influential. This is simply a pocket version of the website. If you want to learn a new language, this is where to go. It even allows for those who do not speak English to learn languages from their mother tongue. Though the options are still slightly limited, it's still an outstanding app, I might even try learning some Spanish. I strongly recommend getting all these apps. Their useful not only for school, but for recreational days and learning new things out of your own interest. I'm planning for this whole Back To School thing to be a week-long series, so I'll see you tomorrow! 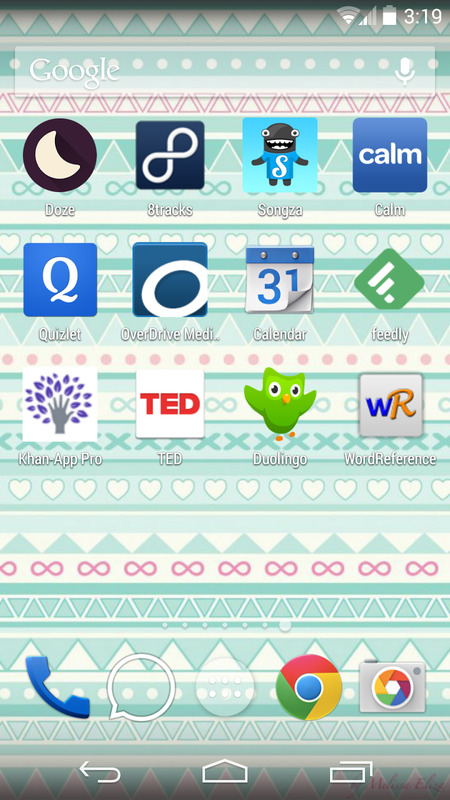 What are your must-have apps for school? I'm glad I could introduce so many new apps to you! I hope you'll be able to find these apps on the Blackberry App World!